I think this definitely falls into the category of speculative fiction. I hope you enjoy it.I would love to know your feedback. Thank you. The Loansman had summoned us. Such an invitation could not be refused. We had heard tales of that office all our lives; of the highly polished wood panelling that lined the walls, of the huge desk inlaid with blood-red leather. Of the ornate fireplace, engraved all about with the various symbols for currency from across The Investment. But it was the ceiling that was the stuff of legend. It was rumoured that every inch of it was delicately, minutely sculpted into images of the human form. Hundreds of naked, cherub-like bodies populating its surface, each one bearing a death mask in alabaster, finely wrought and morbidly fascinating. Those faces shone when the light reached them, the way human skin shines in the glare of the sun. We waited in tense silence in the somewhat disappointingly grubby passageway, like shabby statues lining a grim corridor. I sensed some frustration in the boys, suspecting I was as much the source of it as was our visit her today. I had something of a reputation for recklessness, but even I was not foolish enough to try anything clever here. I thought about reassuring them of that, then thought better of it. I have never been one to make promises I can’t keep. A small, bent-backed man in a smart grey suit hurried past us, covered in an air of cowering subservience. He paid us no mind at all, stopping at the office door to knock upon it gently, “Your next appointment is here, sir,” he announced through the panelling. He did not wait for a reply, but turned on his heel, scurrying away down the corridor, disappearing into the vague darkness at the end of it as if he could not get away quick enough. We watched him go in mild surprise and it struck me as a strange occupation, if all the small man’s job entailed was to knock at the office door to let the occupant within know that people awaited his pleasure. At last, the polished brass door handle was turned. Even the click it made sounded expensive. The dark, glossy door fell effortlessly wide, revealing a beautiful antique floor. The Loansman appeared in the doorway like an apparition. Despite all advice, in the face of all protocol, I could not help but look directly at him. At first sight he was impressive, to say the least. His attire was somber; effortlessly formal, yet devastatingly stylish. His hair was a perfect black, combed neatly, the lustrous strands matching the immaculate sideburns that graced his masculine jaw. He wore a cravat in a shade of emerald green. On another man, it might have been ostentatious. On the Loansman, it was powerfully effective, complementing the deep jewel-jade of his eyes. Eyes that were fixed upon me with quiet disdain. I lowered my gaze kicking myself for such a bad start. It was known to even the poorest debtor that you do not look upon the Loansman until he bid you do so. I cringed, waiting for his anger. It did not come. Instead, he glided wordlessly into the corridor, his contempt for us oozing from him like the heavy scent of his cologne. He walked along us, like a general inspecting his ranks. His arrogance went ahead of him, casting a forward shadow. He stopped in front of Thomas. “You summoned me sir,” I said with a dry mouth, deliberately fixing my gaze upon the gold buttons of his jacket. He did not respond but stood in front of me for an eternity. Scared to open my mouth for fear of putting my foot in it, I paid inordinate attention to those buttons. Even as I did, they changed; the sheen of gold more like gilt. I found my eyes travelling the width of his broad chest, the silk waistcoat taking on the appearance of brushed cotton. Surprised, I bit my tongue and dared to let my eyes roam further. The suit he wore like the night was not so pristine now I looked closer. Here and there it was patched and sewn. It was carefully done, the needlework fine and neat. Nonetheless there were a few stray ends of cotton, betraying the mending work where it had not been cut close enough to the cloth. They stood proud of the fabric like stray hairs; small, yet impossible to ignore once you had seen them. Distracted, my examination travelled further, across his wide shoulders. All at once it seemed to me that there was very little beneath the jacket; little that was really the man, at any rate. I pondered; perhaps he wore shoulder pads, large ones at that. I sucked in a breath, unable to suppress the small “oh” that escaped my lips. I felt his body stiffen, sure I was to be reprimanded. I held my breath, once more awaiting his displeasure. I dared not look at William or Thomas, though I saw William’s fist clench tight out of the corner of my eye. I looked up in surprise. So did the boys, for the first time daring to appraise The Loansman for themselves. I watched their awe and admiration as they first looked him over, doubtless as I had done. Then I watched them more closely, for signs that they had seen the small imperfections too. Their expressions told me they had not; they remained impressed. Realising the boys were still spellbound, I was the first to move, nudging Thomas into action and beckoning William to follow behind. They moved like sleepwalkers, stepping tentatively into the office as if afraid the floor might suddenly disappear and cast them down into the very bowels of hell. We arranged ourselves in an obedient row in front of the desk, like naughty school children before a Headmaster. The Loansman took his time getting to his seat, a huge leather and wood monstrosity that hunkered behind the desk like some furtive beast. As he made his way around to it, I couldn’t help but notice that his desk also looked patched and repaired in places. At first glance a classic piece of furniture, closer inspection revealed that the woodgrain here and there appeared to be going the wrong way, as if someone had inserted odd pieces to fill in holes. The fabled leather inlay was indeed blood-red. It made my eyes swim, appearing to shimmer and ripple as if it were made of some viscous liquid. Eager to dispel the effect, which began to make me feel nauseous, I took a swift look around the room while The Loansman’s back was turned. The floor length drapes hanging at the imposing French Windows were at first glance a luxurious navy velvet, but I saw that they were moth-eaten and ragged around the hems. One of the crystal- clear panes bore a slight crack in a corner, where a spider web traced a finely delicate pattern as if to help hold it together. I was about to risk a glance at the infamous ceiling when The Loansman settled himself into the chair, a sound like a sigh of welcome escaping the padded seat. The Loansman leaned forward, elbows resting upon the wood, hands steepled before him, looking down at the desktop contemplatively. The top of his head showed strands of steely grey at the roots of his hair, the scalp tinged below with a purple-black stain. He dyed his hair. Startled, I did my best to keep my expression bland when he next looked upon us, unwilling to sour his disposition towards me still further. “Nonsense. You end your working day mid-evening. You could work until late evening, could you not? You currently have one day a week when you do nothing, nothing, other than rest at home. That is another day upon which you could be working in order to earn.” It was a statement, not a question. “With respect sir, I am not lazy.” William interjected. “Nor am I.” Thomas added. He stood abruptly and glided across to the French Windows, affecting to look out of them It seemed to me more like he was looking into them, as if they were mirrors rather than windows. He clasped his hands behind his back, his brow furrowed like a man deep in thought. Only now did I notice the signet ring, a large, gaudy, square-headed thing that sat awkwardly on his middle finger. It looked as if it had once belonged to a different man. It struck me that he had not been wearing it earlier; that he had by some sleight of hand slipped it onto his finger only now, for maximum effect. I looked at the boys for some confirmation of my suspicions. Dismayed, I saw that they were once again rapt, utterly taken in by the man and his appearance. For the first time, he showed some signs of animation, his face flushed red with anger, spittle forming at the corner of his mouth. I thought he might reach for the neatly folded handkerchief in his jacket, then understood that it was another falsehood; merely a white triangle of cotton sewn into a fake pocket. Thomas and William actually bowed their heads at that, as if they felt the burden of shame. It was about all I could take. I would have confronted The Loansman then and there, had I not been saved from my folly by an urgent rap at the door. The Loansman inclined his head in irritation at the interruption. “Come,” he ordered sharply. I felt the door swing open behind me and we all turned, expecting the little grey man to come in, or to call out a message. There was no one there, the door seeming to have opened onto a palpable silence, mere empty space beyond. Yet the Loansman made an exasperated face as if receiving an inconvenient message. “Oh, all right, if I must,” he spoke to thin air, “You will excuse me.” The latter to the three of us, as if we had any choice in the matter. He left us with a measured, steady pace, his former composure returned, all trace of the passion and ire gone. The door clicked shut behind him. I released a breath, hearing the boys do the same. We turned to one another as we always did whenever things got tricky. “Well that was weird.” I said. “Can you believe this place?” Thomas whispered in a rush, ignoring me. A knot began to form in the pit of my stomach. The way the boys were reacting told me they did not see things as I did. “You do see it, right? The room?” I asked them both. They looked thrilled and enthralled, as impressed and delighted as children at a circus. They were beaming stupidly, looking about them with undisguised awe. “You have got to be kidding me, right?” They looked at me, their rapturous expressions at once clouded by confusion. “Kidding you how?” Thomas asked. William looked troubled at the suggestion. They looked at one another, then back at me, their faces blank, and I saw that their ignorance was genuine; they were not kidding me at all. They fell silent, considering. William cast an anxious look at Thomas, who shook his head disapprovingly. William gasped; a sharp, indrawn breath of horror at my words. “You don’t mean what you say!” he said. I had not heard The Loansman re-enter the room; had not felt the shifting air as the door opened to re-admit him. The thought that he had been there throughout, that he had heard it all and never really left, crossed my mind. I turned to face him and for the first time since we met, I felt a shiver of real fear. The dye with which he undoubtedly coloured his hair had leaked down his face, leaving deep purple streaks like veins down his forehead and cheeks. It was no longer neatly combed but pushed back in an untidy mess, as if a hand had been drawn hastily through it in a moment of stress. The ring, loose before, was now absurdly so. It fell in slow loops about his finger each time he moved his hand. The false handkerchief was a dirty grey, something sticky and dark in its centre beginning to spread outwards. The waistcoat was stretched tight across his belly, leaving gaping spaces between the cheap buttons. Even as I looked on, one of them snapped free of its stitching and flew across the space between us to land spinning at my feet. I looked down at it, wondering if he had meant to aim it at me. When I looked up again he was closer, though I swear he had not moved a step. Now I could see how long and ragged his dirty nails were, how his supposedly pristine shirt was a sickly, yellowing white. He opened his mouth in a snarl, revealing blackened and rotting teeth. I took an involuntary step backwards, away from him. I stumbled, reaching out to the desk to steady myself. Its surface was worn and greasy, my hand slipping across the wood and onto the blood-red leather. It was warm and tacky to the touch. I retracted my hand instinctively, knowing the feel of it was wrong. I was horrified to find my palm and fingertips were blood stained, one finger crowned by a deep red clot which I shook off in disgust. The red leather was swirling and pooling, here and there escaping its confines and leaking out onto the wood itself. I looked to William and Thomas for support. They looked back at me, William with a patronising air, Thomas with mild amusement. “What the hell?” I began. “Didn’t you wonder why you were summoned?” Thomas asked. I shook my head, confused by his question, “I came along with you. I always come with you; you’re like brothers to me. Where you go, I go. It’s always been that way,” Could they really not see what I could see? “What?” I couldn’t seem to raise my voice above a whisper, so shocked was I by their response. It was true, I knew it. Even now, I expected them to come to my aid, to help me as they had always done. “I don’t understand. I was summoned,” I glanced at The Loansman, who folded his arms across his chest and stared hard at me, “You summoned me.” I finished lamely. “I did not.” The Loansman said. He licked his dry lips with a tongue that seemed suddenly too fat for his mouth, a sickeningly sensual gesture that made my stomach turn. “Ask your friends.” he said, spittle dribbling down his chin to land thickly upon the filthy cravat, its’ gorgeous emerald shades now dull and lifeless. I turned to the boys; my lifelong friends, my almost-brothers, the question stuck in my throat for fear of the answer. William looked hard at me, his eyes searching mine as if he expected me to know why. In truth I think I did, but I did not want to acknowledge it. I turned to Thomas, my eyes pleading. “What?” I said again, the word empty on the air. “You are the property of The Investment,” The Loansman spoke thickly. I ignored him, desperate to make Thomas and William see the error of their ways. “What am I to do then? Where am I to go when you have made me destitute?” William turned away from me, Thomas merely shrugged. Something stirred above me, some movement overhead catching my eye. I looked before I remembered the rumours. I heard The Loansman give a soft snicker of laughter. It was all true. The ceiling was crawling with limbs, alive with small faces; if not in alabaster then in a tarnished, ancient plaster. They were tiny, like the shrunken heads in the stories of old; as if someone had made them smaller to fit them in the cramped space. Their eyes were stretched wide in various depictions of terror, the mouths all working madly in voiceless despair. Not a single arm broke free of the ceiling, though I felt sure if they could they would have reached out for help. There were so many of them up there, writhing and squirming, never able to escape their confines. I knew without asking that they were not the result of some gifted, hellish sculptor’s but real, living people, though the form of their existence was utterly repugnant to me. I stared at him, unable to find words to speak, unsure that I could say them anyway. I felt a dry heat all over, like I was coming down with a sudden and unstoppable sickness. I suppose in a manner of speaking, I was. “You will be one of them soon.” he added, raising a hand and dragging the soiled sleeve of his jacket across his lusty mouth. He did not take his eyes off me, regarding me as if I was a tempting main course on an especially mouth-watering menu. I thought to plead with Thomas and William. I thought that even now, when I knew in my heart it was already too late, they might step in and rescue me, like they always did. They were standing side by side, shoulder to shoulder, visibly united in their cause, though I was gratified at last to see a trace of doubt and horror flicker across their faces. The Loansman, that filthy, ragged beggar in disguise, came towards me. I could not prevent the cry from escaping my lips, dreading the thought of the clammy flesh of his hand upon me. He passed me by as if I was of no further interest to him, approaching Thomas and William instead. “It is,” they replied in unison, with all the solemnity and authenticity of a couple reciting marriage vows to a vicar. I stiffened, keen to know how they would answer that question, eager to learn if they had been forced into this, or if they were offering me up as a ready sacrifice to pay for their own greed. “We do,” they intoned again. That was the moment I knew I was truly lost. That was the point at which I began to feel a strange unsteadiness on my feet, a light-headedness as the room began to slowly yet inexorably spin in an off-balance, counter-clockwise motion. I watched helplessly as Thomas and William sank into large, embracing wing-back chairs in Oxblood leather which I swear had not been in the room before. The Loansman once more circled his desk, lowering himself into the waiting seat that seemed to fold about him. He reached under his desk and slid open a drawer, from which he took a sheet of paper that he set before him. He slid the drawer smoothly shut, then reached to his left for the pen that lay cradled in a bronze rest like a treasured item. He clicked it noisily, the nib revealing itself, poised over the paper. He looked at me, or what was left of me. I felt I was slowly melting out of existence. I was whole still, yet somehow not whole. As if I had ceased to exist as a solid being and was instead becoming some form of gas, eddying and billowing in a skin-tone cloud; spiralling, gyrating, my nebulous feet leaving the floor, my voice lost, becoming weak as a distant breeze. Even if I could speak, they would not hear me now. What use anyway? They would not care. I waited for my thoughts to leave me, wishing they would. For although my body was becoming nothing, my mind was as clear as ever, allowing me shock and panic as fully as if I were still real. Leading me to believe that my wispy heart was pounding, that my airy blood was racing. That my eyes were full of tears and my chest about to burst with grief and terror. I watched as The Loansman scratched the pen drily across the paper, realising with a jolt that I was looking down upon the scene from some height. The Loansman was frowning at the dryness of the pen, dipping it into the red leather desk covering. It came away full, dripping with scarlet ink. I watched as fat, ruby droplets splashed into the leather, creating small, circular ripples that radiated outward like raindrops into a pond. My blood, I knew. 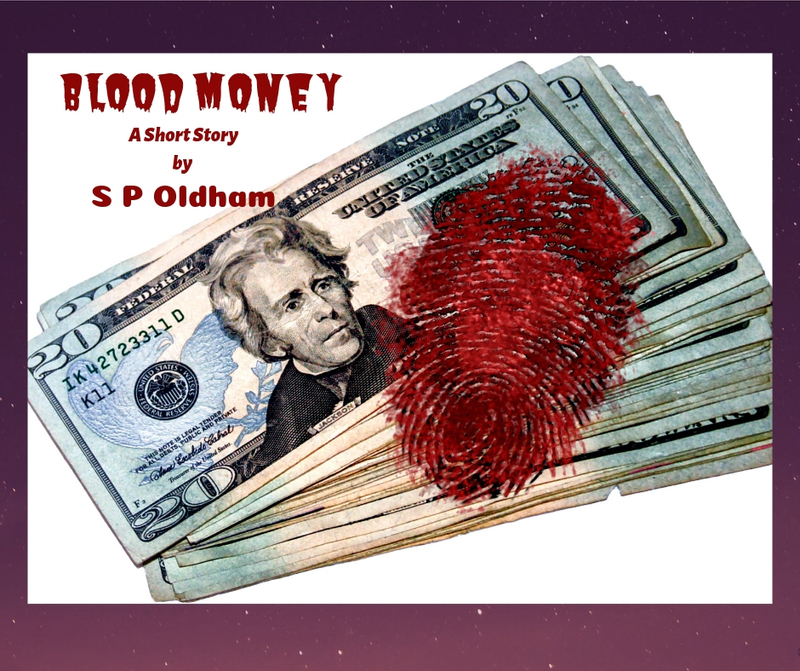 My blood; spilling and falling onto that sinister covering that I suspected was not a covering at all, but an endlessly deep pool that went far below the confines of the desk and the floor below. “Ah! That is what they mean when they say you are in the red!” Thomas quipped. The joke at my expense hit me like a physical blow, despite my reduced state. William laughed aloud, even The Loansman allowed a grin to cross his sordid features, though his rolling eyes told me it was not the first time he had heard the pun. There was a sudden cold hardness at my back, the cloud-like feeling leaving me abruptly. I was once again solid, though not as I had previously been. I felt a strange paralysis, in which I could feel every inch of my body, yet I could not pull it free from whatever forced anchored me to the ceiling. “She cannot fall from there? Be released from her bond?” I heard William enquire. “She cannot.” The Loansman confirmed. “And to ensure that you never again fall behind; yes, indeed you must,” The Loansman clarified, “I trust that I need not explain to you the consequences of any further missed payments?” He gestured up towards me, William and Thomas both craning their necks to follow his pointing finger. It took a while for them to locate me, I think, in amongst the swirling mass of arms and legs, the array of shrunken heads. I was screaming at them to help me, raging at them for what they had condemned me to, yet not a sound escaped me. I felt others close to me, straining against their invisible bonds, fighting and struggling to be heard, to be freed. I could feel the workings of their silent mouths, sense the despairing rage behind their efforts to break loose. They tore their eyes away from me at last. Finally, I heard a note of dread in Thomas’s voice, “We understand.” he rasped, nudging William into responding. “Yes. Yes of course, we understand.” the word ended in a sob. It was useless. Even I could not hear my own voice except for in my head. Thomas and William stood, visibly shaken. They slunk from the room like scolded children, William casting a last glance up at me as he went. He looked sorrowful, like he might regret what he had done. The thought enraged me. Guilt, sorrow, shame; none of these things were enough. None of them would ever restore me to the world or to my life again. I cursed him as he went, hurling at him every foul, coarse, vulgar word I had ever heard in my impotence: nothing I said would ever be heard again. The door shut with a subdued clunk. The Loansman smoothed down his jacket, slicked back his hair, returned to his chair with an air of practised ease. He paid me not a moment’s more attention. I had become an irrelevance to him, now that the debt was paid. Finally exhausted, I gave up trying to make myself heard and fell silent, taking in the room below me. All trace of shoddiness had disappeared. The room and the man were once again a splendid sight, the Loansman tastefully opulent in both his bearing and dress, the room sumptuous with fine fabrics and costly materials. One of the many emblems of money carved into the ornate fireplace suddenly bulged fatly, as if it was taking a breath. It was the symbol for money from my home on The Investment. I had made my final contribution, it seemed. In my mind’s eye. I could see the small, grey-suited man scurrying away down the corridor into the safety of the all-encompassing darkness at its furthest reaches. In his chair below me, The Loansman suddenly came to life. He sat up, at once alert, straightening the beautiful emerald cravat at his neck, patting the spotless white handkerchief in his top pocket. He stood, every inch a man of respectability and assurance, to approach the door. It swung silently open. The Loansman stepped out into the corridor, pausing in the doorway to look his visitors over.